SIGNING NEWS: ZAJAC & MORRIS! Your Go Goodwins sponsored Manchester Storm are delighted to announce the signings of Sam Zajac and Liam Morris on two-way contracts! Zajac, a British defenceman who has previously iced in the EIHL with the Braehead Clan from 2011 to 2014, is currently on the Whitley Warriors (NIHL) roster. He wears the “A” and has totalled an impressive 36 points in 28 games. He is expected to be in the line-up for the match this Saturday against the Guildford Flames. 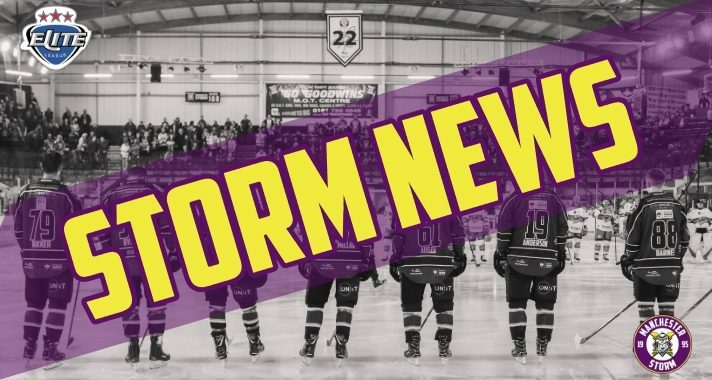 Morris is set to make an appearance for the club on Wednesday 20th February, as we take on the Dundee Stars in our mid-week fixture at the Storm Shelter! Morris, a British forward who is currently on the Basingstoke Bison (NIHL) roster, has picked up 8 goals and 10 assists in 17 games for the Bison. Under Head Coach, Ryan Finnerty’s guidance, Morris is looking to make an impact at EIHL level. You can read about Zajacs stats here! Read about Morris stats here! Tickets are on sale NOW for this Saturdays crucial match against conference rivals, the Guildford Flames! With valuable conference and league points up for grabs & a bumper crowd expected, this is one NOT to be missed! Secure your tickets now online or by calling the Planet Ice Box Office on 0161-926-8782!